Today I have for you the next part of my Vintage Tea With Me Series, but today’s video is a little different. Instead of talking about topic or opinion I’m sharing how I’ve been feeling lately. Just like everyone else I experience highs and lows. I’m spilling the tea on the some things that have been weighing down on me, and making some commitments to myself. I did actually record this video Thursday last week, and my week did up getting a little more dramatic and I did need to take some time to process is which is why I was quiet on social media. Thank you again to all those who’ve shown me support. I’m feeling much better now. My next video should be up on Thursday 8am! Subscribe to my YouTube channel to never miss out on any of my vintage fun. My next fabulous blog will be online tomorrow! 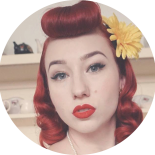 This entry was posted on November 20, 2018 by Miss Lady Lace in health, Videos, vintage tea with me, YouTube and tagged 1940's, 1950's, blogger, glamour, miss lady lace, miss lady laces pinup blog, perth, perth pinup, perth pinup blog, perth pinup community, pin up, pinup, pinup blog, pinup blogger, pinup fashion, pinup girl, pinup life, pinup lifestyle, pinup perth, red lips, retro blog, retro girl, retro glamour, the perth pinup community, victory rolls, vintage, vintage blog, vintage blogger, vintage fashion, vintage girl, vintage glamour, vintage perth, vintage pinup blog.